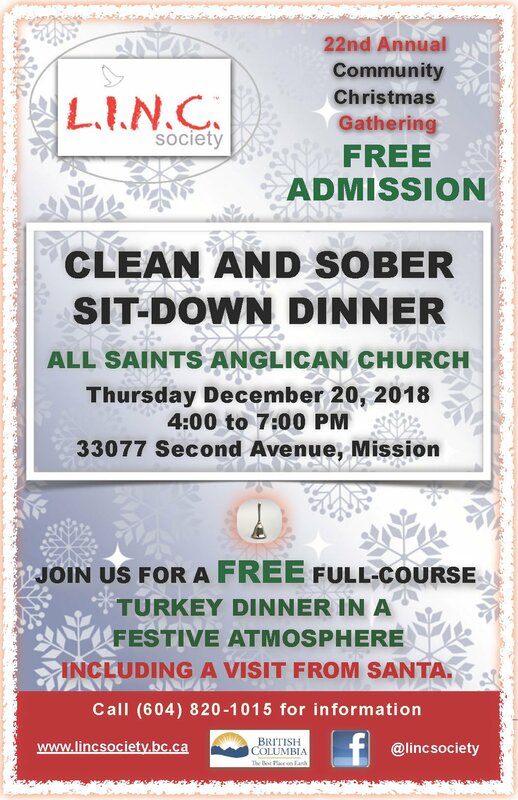 The Clean and Sober Christmas Dinner is a complete turkey dinner with all the trimmings along with carolling and a visit from Santa for the kids. The dinner is usually held from 5-8pm on a day early in December. In 2015, over 350 people were in attendance. A sample of the poster used to promote the event appears at the bottom of the page. Seniors, other members of the Mission community, volunteers etc. The program creates a sense of community. People from throughout the Fraser Valley come to donate their time or food for the Christmas dinner. In 2012, the CBC National did a TV piece on the L.I.N.C. Christmas dinner (see below). The piece is titled “Rebuilding Lives for the Holidays”. Click image above to download a PDF version for sharing or printing.